It is easy to forget what family truly means when everyone is running to and fro throughout the day. Bring your family together with this fun project. The Family Honor Plate is meant to be a tool to encourage and lift up someone in your family as often as you like. The box comes with everything you need to paint your plate and put it into action: plate, stand, paints, brushes, paint palette, and a sample of their Let’s Talk discussion cards. First you start by painting and decorating your family plate however you decide. Of course you are free to let your children paint the plate (the paints wipe up very easily while they are still wet) but my kids couldn’t agree on what to paint. So I decided to paint ours with a Christmas theme and our monogram. Once the plate is painted how you would like, bake it in your oven according to the directions then it is ready to use. So how do you use this honor plate and what is the point? The fruits of the Spirit are printed on the center of the Family Honor Plate so everyone can refer to them when it comes to how to act as Christians. The idea is to honor one member of your family by serving their meal on the plate when they have acted according to these character traits. They may have shown kindness to their sister, shared a toy with their brother, obeyed mom and dad, etc. The list of possibilities is endless! This is a great parenting tool you can use to encourage your children to develop the fruits of the spirit in their lives. I love how the set came with a stand to display your plate while it isn’t in use, and how the fruits of the spirit are printed right on it for a continuous reminder. We also got to try out the “Let’s Talk!” Table Thyme Discussion Cards. 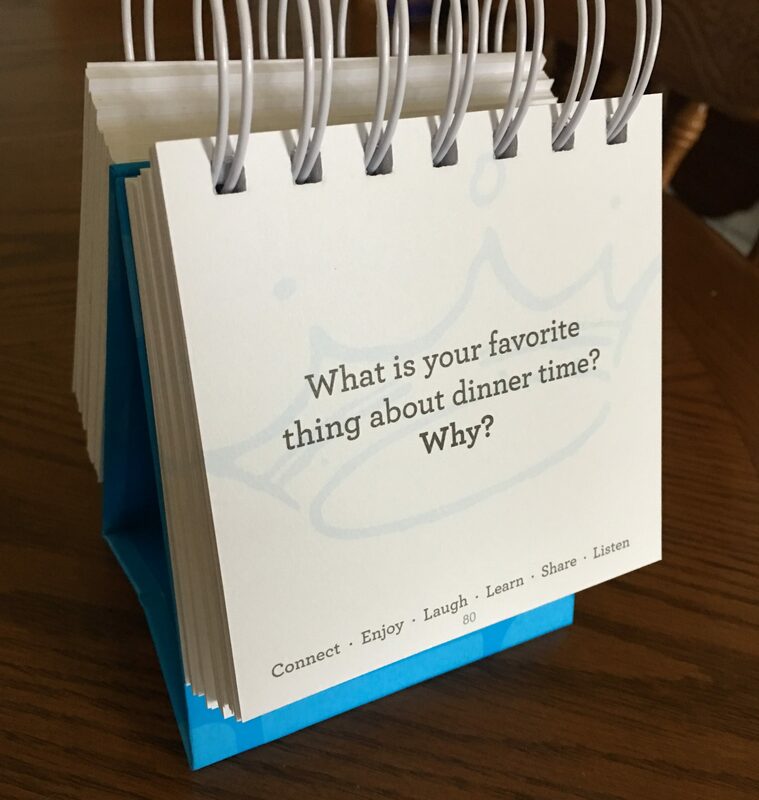 This is a fun little table-top, spiral bound set of questions to ask at during your meal to facilitate discussions. Even a close family needs grow closer and these are great ways to learn more about each other’s thoughts, feelings, homes, and dreams. You can read one question for everyone to answer and compare answers or you can let everyone answer a different question. My kids had a ball picking questions for each other too. It has been so fun! These cards are so much fun! My kids ask to read through some at nearly every meal. I keep them in the dinning room so they are on hand. 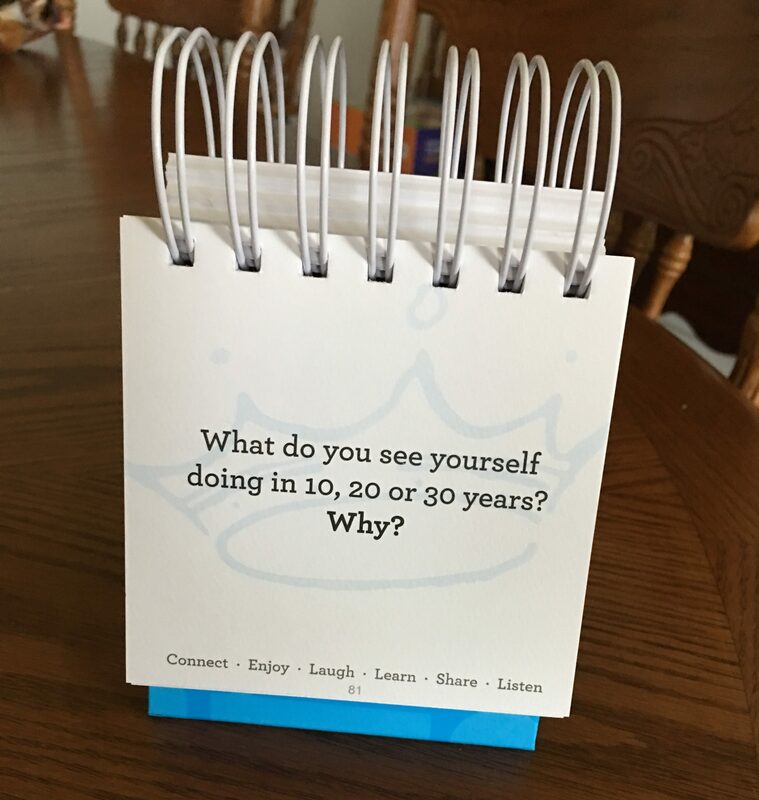 I love how the questions vary from broad topics to some that require thought and detail. My only complaint is the set doesn’t stand up if it is closed (it falls over) but that is pretty minor. I would highly recommend the Family Honor Plate and the Let’s Talk Table Thyme Discussion Questions to any parents or grandparents who want to instill values and good character in their children and grandchildren.